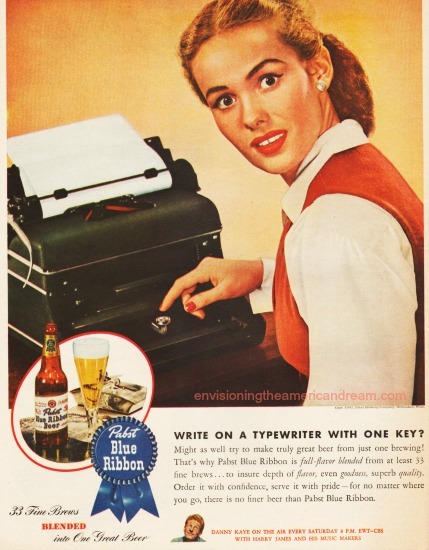 Who would have guessed Pabst Blue Ribbon that iconic working class beer ironically embraced by hipsters has a pedigree more blue blood than blue-collar. 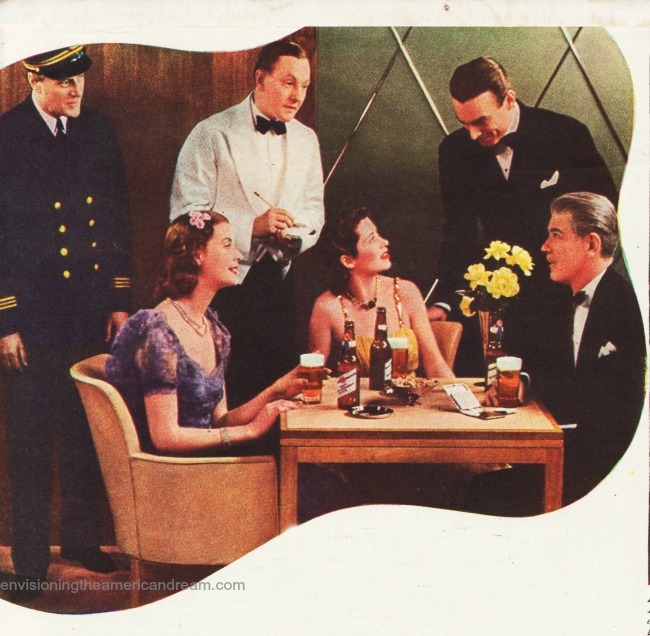 75 years ago Pabst positioned itself to appeal to the “gay, smart modern set” hoping members of Café Society would pass on that glass of champagne favoring a bottle of the Milwaukee brew instead. 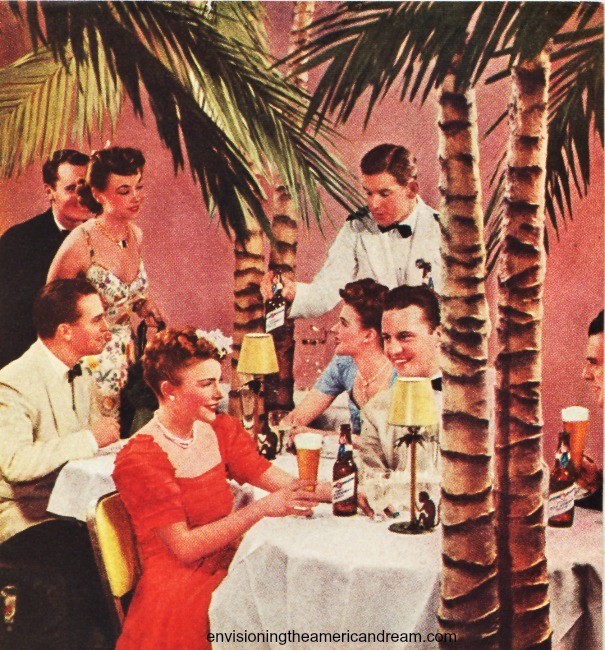 In an ad campaign from 1939 featuring swells more Wall Street than Williamsburg, the ads pictured sophisticated men-about-town in elegant tuxedos and glamor girls decked out in Elsa Schiaparelli gowns living the high life frequenting exclusive haunts from The Stork Club to The Coconut Grove. 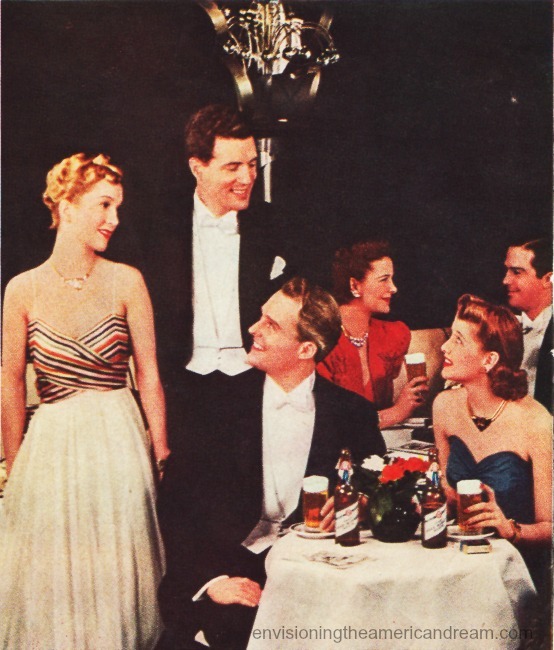 The ads would have you believe these scions of hi society eschewed their jack Rose Cocktails while supping at the Waldorf Astoria in favor of a bottle of Pabst Blue Ribbon. 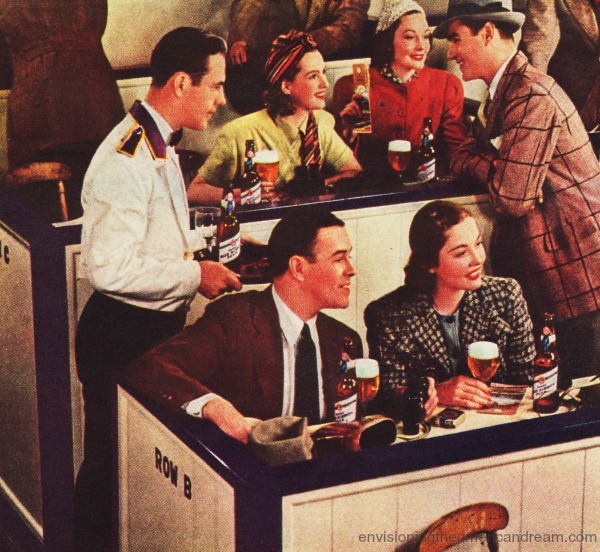 A far cry from the 70’s themed dive bars that currently dot hipster meccas from Portland to Bushwick where skinny jeaned hipsters with thick framed glasses sport Pink Floyd T-shirts, carry Freitag courier bags filled with vinyl LP, and ironically hoist cans of red white and blue PBR. 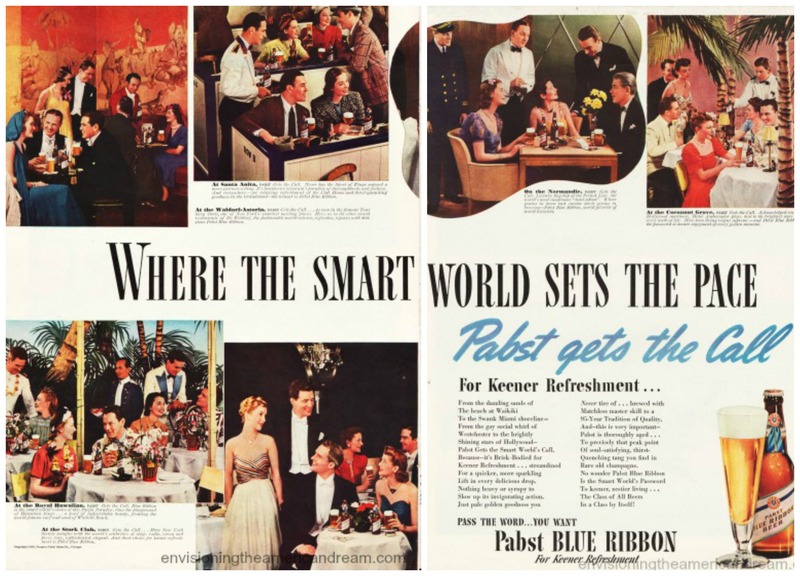 “From the dazzling sands of the beach at Waikiki to the swank Miami shoreline- From the gay social whirl of Westchester to the brightly shining stars of Hollywood- Pabst gets the smart worlds call. “Because –its brisk bodied for keener refreshment…streamlined for a quicker more sparkling lift in every delicious drop. Nothing heavy or syrupy to slow its invigorating action. 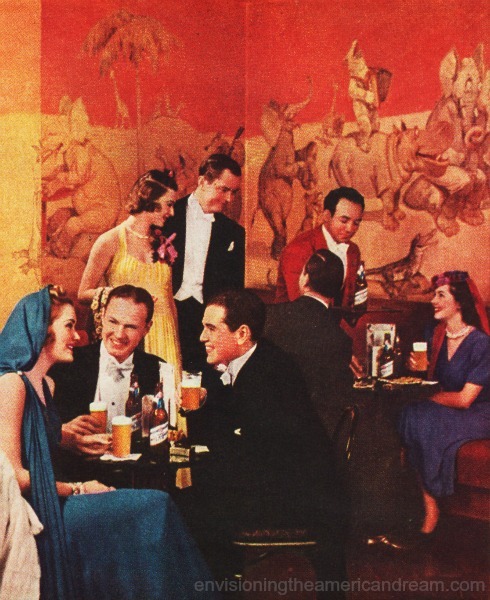 While urban hipsters might arrive in their fixed gear bicycles no doubt these swells drove in their Packard’s to imbibe in Pabst in the Waldorf splendor. 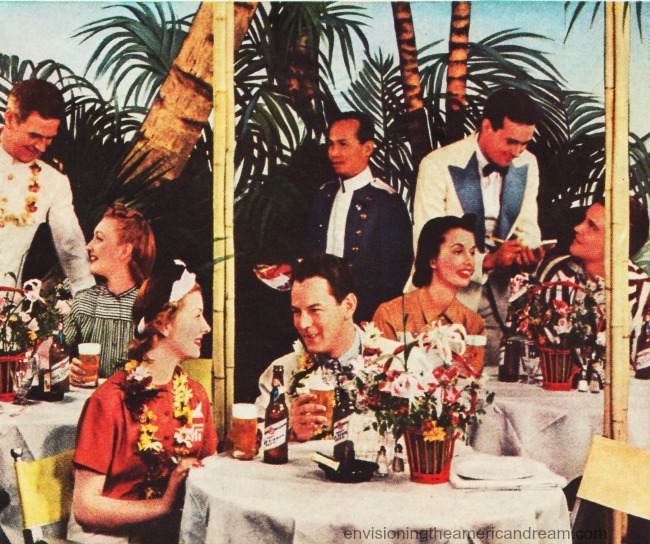 Pabst was down on its heels, before Portland another west coast Paradise co-opted PBR as their own. Today, Tattooed bearded Brooklynites in fitted hoodies mingle with alt band musicians in a sea of gingham, plaid and checks. © Sally Edelstein and Envisioning The American Dream, 2014. Unauthorized use and/or duplication of this material without express and written permission from this blog’s author and/or owner is strictly prohibited. 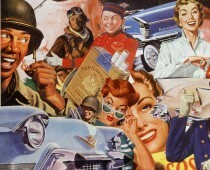 Excerpts and links may be used, provided that full and clear credit is given to Sally Edelstein and Envisioning The American Dream with appropriate and specific direction to the original content. I notice that only the waiters touch the bottles — as if they were pouring wine. Society folks only drink beer from a glass. Once, after a job interview, my husband and I were invited out for a casual drink. Good thing he ordered gin & tonic; we were later told he got the job (at a prestigious college) because the other leading candidate had ordered a beer, and “He drank it out of the bottle!” Shocking. I am definitely sharing this post.